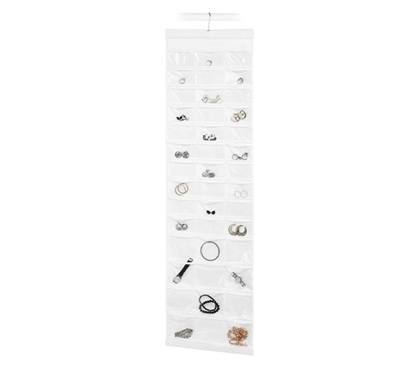 If you have enough jewelry to fill this organizer for college, you could probably sell it all and use it to pay for college! Just kidding. That jewelry is precious no doubt, so make sure it doesn't go missing. If you bring the Extra Long 84 Pocket Jewelry File as part of your college supplies, you won't have to worry about storage space for all those earrings, necklaces, rings, and other jewelry. This hanging organizer will hold them all. In fact, with 84 pockets, we're willing to bet you'll have added storage space that can be used for a variety of other smaller college dorm items as well. We don't have to tell you what a crisis it can be when you lose a pair of you favorite earrings or your best necklace. By keeping that jewelry all piled up in a drawer or some big jewelry case, lost valuables can be all too common. The nicest feature about this hanging organizer, besides its size and volume of pockets, is that it's see-through! When you think you've lost a ring and you're digging through some jewelry organizer or cosmetics bag to try and find it, it's a moment of unwanted high anxiety and stress. You can glance right through this organizer and know right away if that valuable ring is still in your possession. Phew!